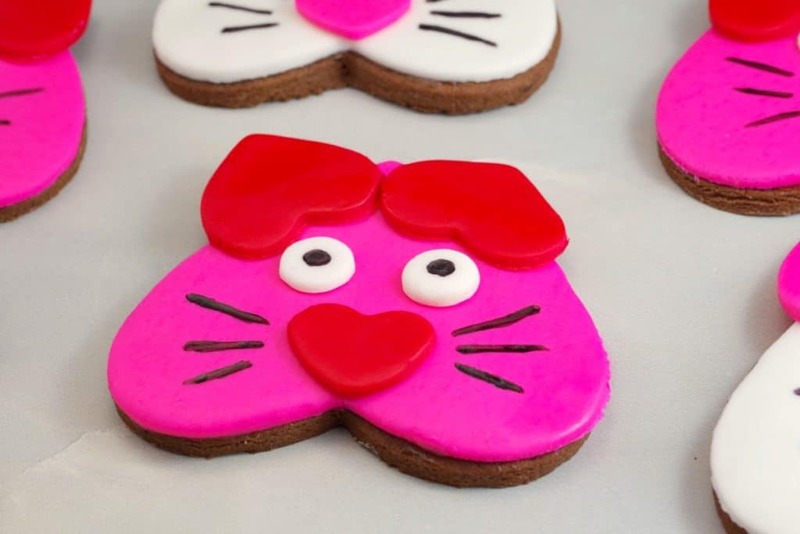 These heart-shaped cat cookies for Valentine’s Day are really fun and easy to make! They were inspired by a paper valentine I saw many years ago. 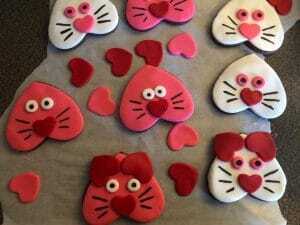 At the time, I designed this cookie as an edible valentine for my daughter’s daycare class and the kids loved them! I started decorating cookies with fondant specifically because it’s soo much easier than royal icing! I always struggled with getting the consistency right for outlining, flooding and detailing with royal icing. It really was a hassle. Where as fondant is simple – you roll it out, cut it with the same sized cookie cutter you used for the cookie and adhere it to the cookie. And you can “glue” fondant pieces to each other with a simple drop of water or a little syrup. 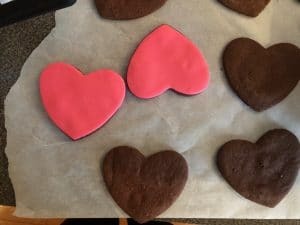 Chocolate is just plain necessary on Valentine’s Day, so that is why I used this rolled chocolate sugar cookie recipe, but you could use any sugar cookie recipe. It’s up to you, but this chocolate sugar cookie is really delicious! 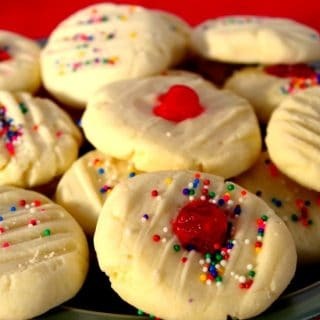 I like them because they are similar to my No Fail Sugar Cookies in that they don’t lose their shape when baked. 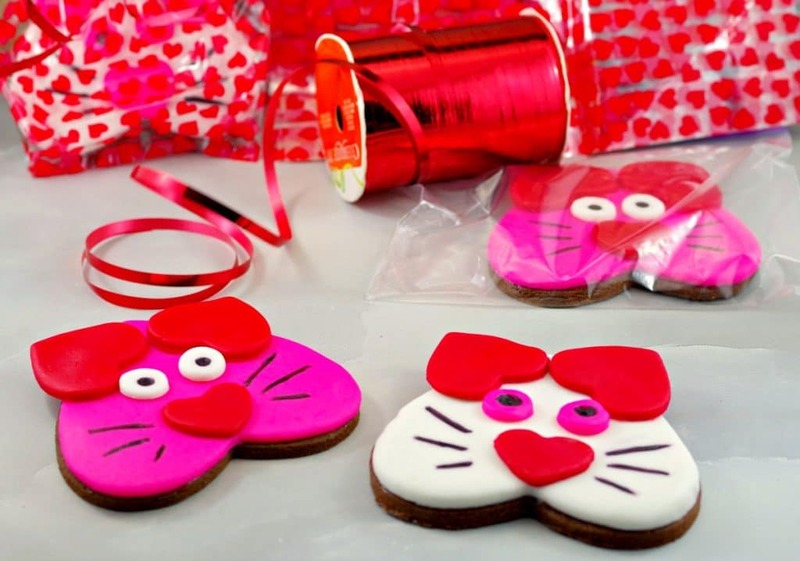 These hearts cookies make a great edible Valentine’s gift for kids or any cat lover! 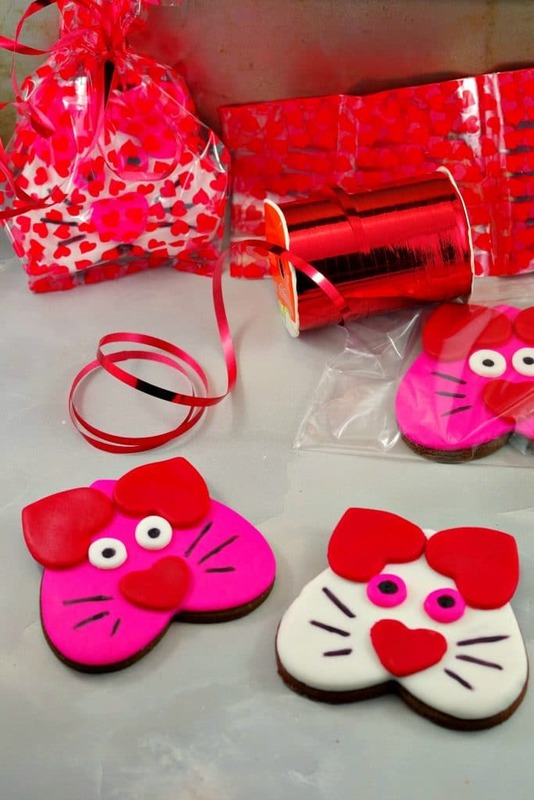 Put them in a cute little heart bag (or even a simple zip-lock) and use an edible marker to personalize them. I made these for my daughter’s daycare class years ago, but we also made them for her dance class this year (including the instructor), as it falls on Valentine’s Day! 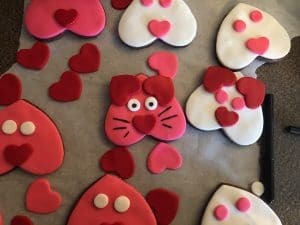 Anyone who knows me knows that I’m a bit cat crazy, but you don’t even have to be crazy about cats to love these cute little Valentine’s Day Sugar Cookies! 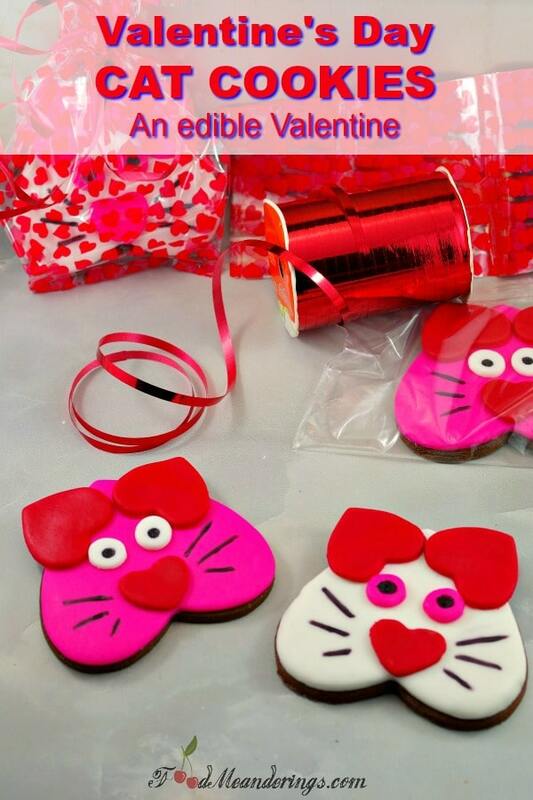 So, if you’re looking for Valentine cookie decorating ideas or Valentine cookies recipes, then give these a try! I don’t know about you, but when I was a kid, I would have much preferred to get a cat cookie valentine over a paper one any day! 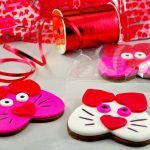 These easy fondant covered heart-shaped cat cookies are made out of 3 different sized heart cookie cutters and edible marker. Use this delicious rolled chocolate cookie recipe or your own sugar cookies recipe. Either way they make a wonderful edible Valentine's Day gift! Whisk flour cocoa, instant coffee and salt together in a medium bowl. In a separate, large bowl, beat sugar and butter together with an electric hand mixer until fluffy. Add egg and vanilla and continue beating until well blended. Gradually add the flour mixture to the butter mixture (with the electric mixer on low) until thoroughly blended. Continue mixing with hands, kneading as you would for bread, until dough clings together. 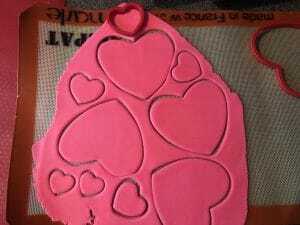 Roll out onto floured surface to about 1/8 inch thick and cut into largest heart shapes. Transfer with spatula to prepared cookie sheet. Bake for 14-16 minutes or until light brown on bottom. Cool and decorate. Roll fondant to 1/4 inch thick and cut largest heart. Let hearts dry out for 15 minutes for best results. You'll want to cut the medium sized hearts for the ears at the same time, as they need time to dry as well. 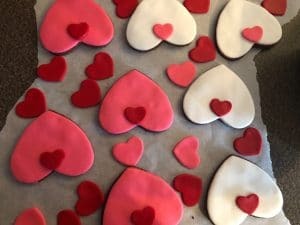 Add a thin layer of syrup to the top of each cookie and gently lift fondant hearts onto cookies, gently spreading the fondant to the edges of the cookies so it covers the entire surface. For the face: turn the hearts upside down and add the smaller hearts for the noses. You can adhere it with a little syrup or a dab of water. For the eyes: use a small round cutter (I use the back of an icing tip) to cut out the eyes. Adhere the eyes and ears with a little syrup or water. Use the black edible marker to draw in the centre of the eyes and the whiskers. 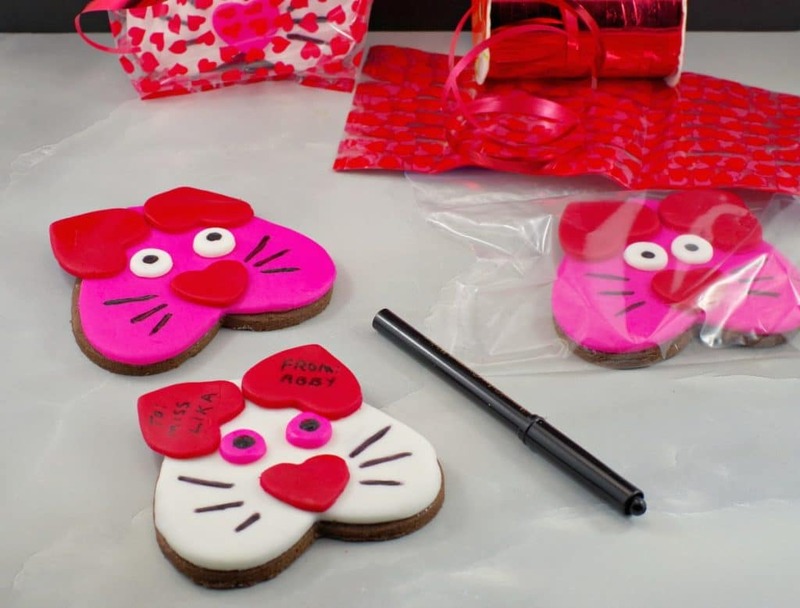 If desired, use the black edible marker to personalize the cookie as a Valentine and wrap as shown. Storing: store in a long sealed plastic container between sheets of parchment paper (they can be frozen this way as well). * Do not write on them if you are going to freeze them! Note: These cookies can be left in a airtight container for up to 3 days. They can also be frozen for up to 3 months. But after removing them from the freezer, it's important that you let them air dry completely BEFORE writing on them with edible marker. You will know they are dry when they are no longer sticky to the touch. **DO NOT put fondant cookies in the fridge - it causes fondant to sweat. This post is party of Creative Kids Tasty Tuesdays! This is a cool idea! These looks so cute. Thanks for sharing ♥️ ♥️ By any chance you are interested on doing collaborations, you can check out the collaborations portal of Phlanx.com and connect with amazing brands! 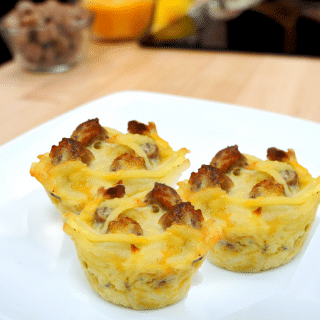 Oh how I wish I had this recipe when the kids were younger, it is just super cool! Now they do not want to hand out treats or cards anymore but we may just have to make them at home and eat them ALL~! These are the cutest and so simple, I love the fondant idea for topping, it looks great especially when personalized with the edible marker. Where did you find the marker? Thanks for sharing this fabulous recipe! Hi Sabrina: Thank you! Oh, you can get the edible marker online (Global Sugar Art) or at most craft/cake decorating supply stores. I like Americolor Gourmet Writers the best- I’ve tried many brands! These cookies are as cute as can be, Terri! I am sure they were appreciated by everyone who received them and so much fun to make. Thanks for sharing. Thanks, Denise! Yes, my daughter’s dance class loved them! These are so perfectly decorated! I absolutely would have preferred getting these as a kid over paper valentines! Decorating them would also be a fun activity with kids!